A Jewish wedding ceremony is often generally referred to as a ‘chuppah’. However, the original meaning of ‘chuppah’ is a canopy. Therefore, a Jewish wedding traditionally takes place underneath a canopy, symbolizing the home that the couple will build together. 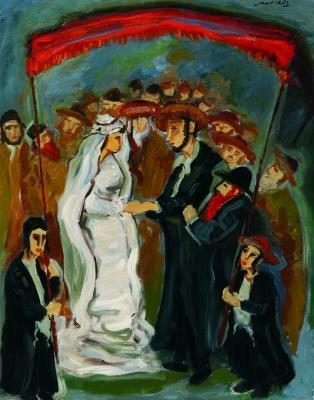 In this painting the Jewish painter Emmanuel Mané-Katz depicted two younger boys holding a bright red canopy above the bride and groom. Many elements in the painting are typical for (Orthodox) Judaism. The Jewish men are bearded, wear hats and have long, uncut sideburns. Following a Biblical commandment not to shave the sides of one's face, the Jewish men have ‘payot’, the Hebrew word for sidecurls. Furthermore, on festive occasions the men wear a special fur hat, called a ‘shtreimel’. The bridegroom and some of the male guests are wearing one. Mané-Katz used bold colours for the scene - bright reds, orange, white and black - creating a powerful scene with heavy contrasts. He focused the composition on the intensity between the bride and groom looking at each other, emphasizing the intimacy and importance of the moment. Mané-Katz is a Jewish painter who is mostly known for his depictions of Jewish wedding scenes. He was born in 1894 in Ukraine, but moved to Paris at the age of 19. 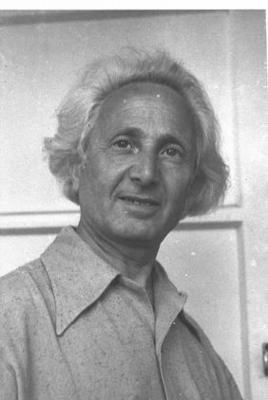 His father wanted him to become a rabbi, but Mané-Katz started studying art instead and soon became affiliated with an art movement known as the Jewish School of Paris. He was close friends with the renowned cubist painter Pa . . .